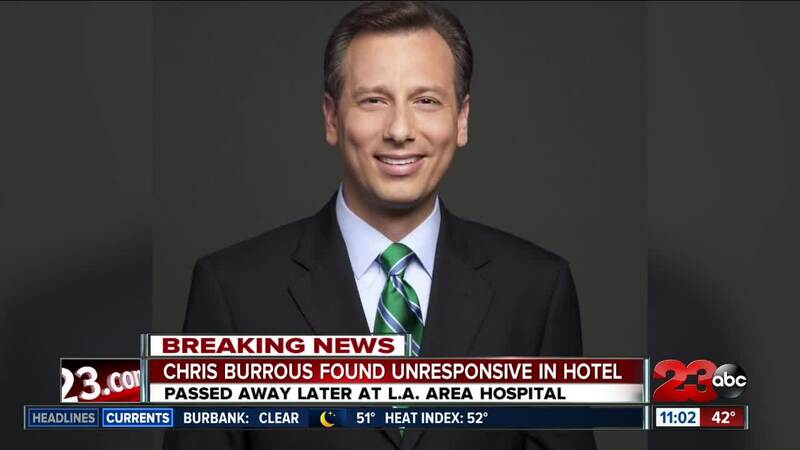 Chris Burrous, a beloved KTLA anchor and former Bakersfield anchor has died. He was found unresponsive in a Glendale hotel and passed away later at an LA area hospital. Chris Burrous, a beloved KTLA anchor and former Bakersfield anchor has died according to reports from KTLA. Our sister station in Los Angeles, KABC , reported that around 1:14 p.m., Glendale police received a call from a man about a person who he was with that had passed out and wasn't breathing. The caller said that they were at the Days Inn and when authorities arrived, they found a man inside a room who had suffered from a medical emergency. The man wasn't breathing and CPR was performed. According to KABC, authorities said that the cause of Burrous death remains under investigation. The KTLA President and General Manager Don Corsini and News Director Jason Ball issued a statement. Burrous came to Bakersfield in 1999 where he worked as a morning news anchor at KGET. It was there that he met his wife, Mai Do-Burrous. Burrous joined KTLA in 2011, after spending over a decade as a reporter and anchor throughout the country. He was 43 and is survived by his wife, Mai Do-Burrous, and 9-year-old daughter, Isabella.